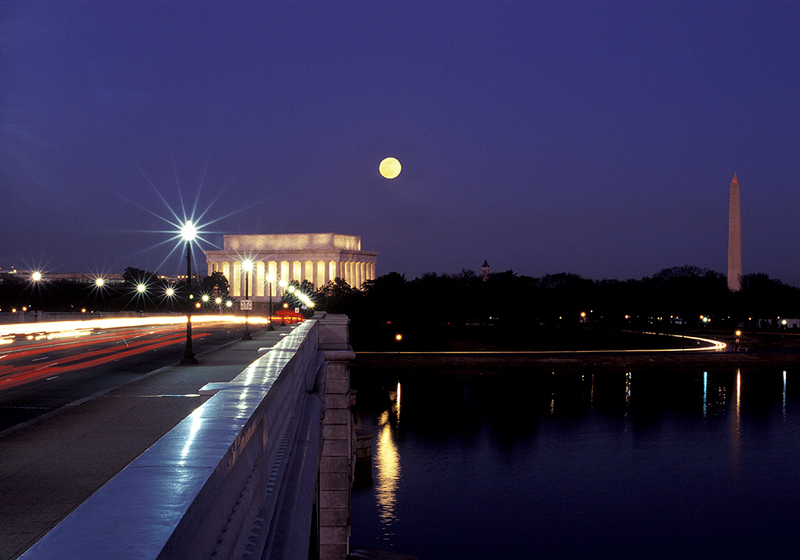 When photographing a rising full moon one needs to know two things: when will it come up and where will it come up. The first question is easy enough; you can find moonrise data in most newspapers, usually in the weather section. But the “where” question is a little tricky, especially if you want it in a specific location in the composition. The reason is that the lunar cycle is about 18.6 years, so a perfect alignment such as the image below won’t happen again for a very long time. This is particularly important when you wish to capture the moon right next to, or just above, a specific architectural element in an urban environment. You don’t have a lot of time to get to the exact spot because the moon’s location changes quickly as the earth rotates. So you need to be set up and ready to go before the moon appears. Fortunately, this is much easier to do today than just a few years ago thanks to things like smart phone, tablets, and “apps” such as The Photographer’s Ephemeris. 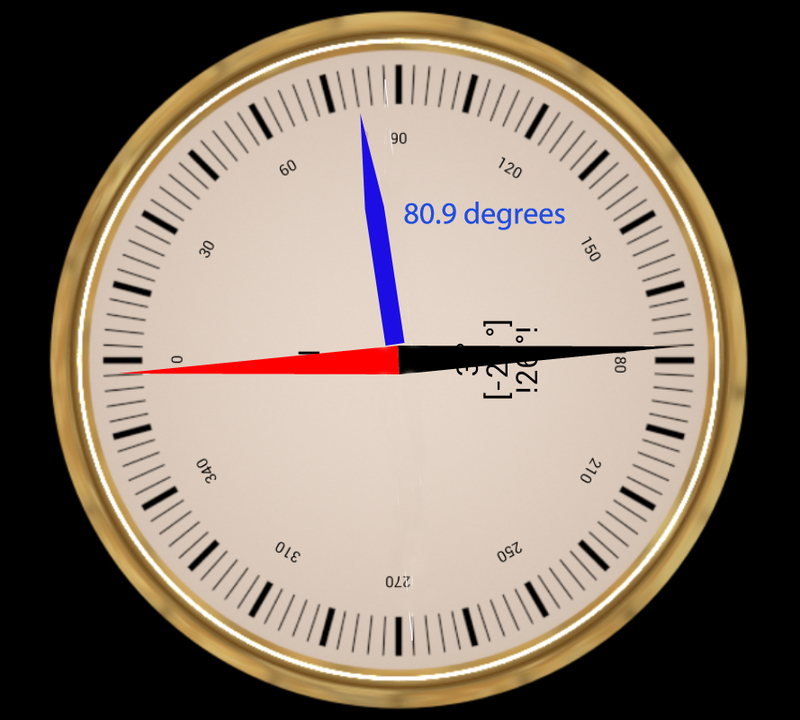 Further, the USNO site showed that the full moon would rise at a compass azimuth reading of 80.9 degrees. We all know that the direction due east is exactly 90 degrees on a compass so the moon would be coming up a little bit to the “left” of due east. But something a little more precise would be needed because in this case, one could in a position where the moon was coming up behind the Lincoln Memorial and it would not be visible until it was too late. An accurate compass can provide that precision as shown in the graphic below. So on the day of the moonrise, I drove down the George Washington Parkway and parked in the lot for Theodore Roosevelt Island about 45 minutes before sunset. From there it was a short hike down the Mount Vernon Trail to a point several hundred yards north of the Memorial Bridge. I used the compass to find a location where it was exactly 81 degrees from where I was standing to the spot where I wanted the moon to be—just to the left of the Lincoln Memorial. I set up my tripod and camera, attached the cable release and began to wait. I was the only photographer there. It is at this point where you have done everything you can to be in the right place at the right time. The rest is basically luck and is the element that makes these moments so special…or not. Will the sky be overcast? Will a small cloud obscure the moon at the critical moment? 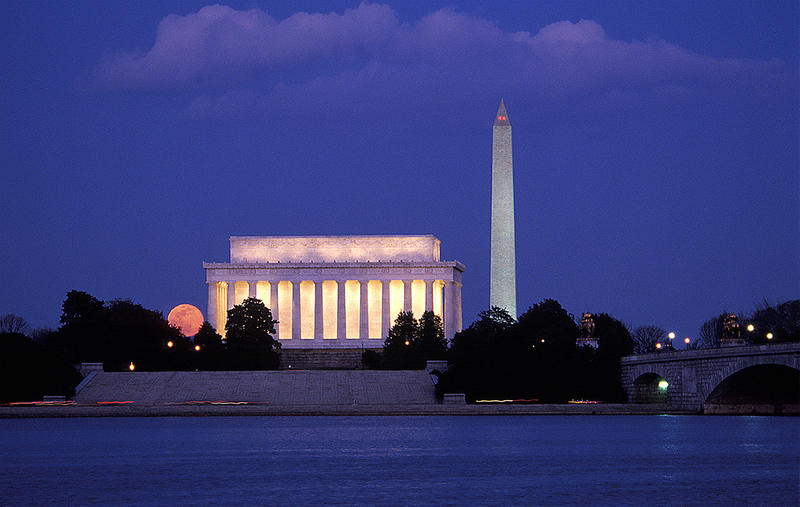 But on this night everything worked out well: the twilight blue of the evening sky, the dark orange glow of the moon as a result of perfect atmospheric conditions, and a small pink cloud from the setting sun nicely positioned directly above the Lincoln Memorial. In this case, the moon came up on an azimuth of 62 degrees, much farther north than the March 9 2001. From the shooting location, it would have risen right behind the Lincoln Memorial so I had to wait for a while before it got to this point. Again, this was taken well after the time the moon first broke the horizon, but I wanted to place it next to the dome. This was taken two days before the full moon. In all three of these shots, I was using a Nikon F-100 and shooting with Ektachrome 100 VS transparency film. Back in 2001, when I decided to get serious about photography, I signed up for a workshop with Galen Rowell at his studio-gallery in Emeryville, California. Little did I know that this week-long seminar would have such a great influence on my approach to photography. It was there that I first heard the term “Magic Hour.” Galen described it as the time when the sun is close to the edge of the earth’s horizon and the cool blues of the night mingle with the warm colors of the day. Since then, I would estimate that 80% of my images have been taken during that time which occurs twice a day, at dawn and dusk. We were all shooting film back then, but Galen was well aware of the approaching tsunami of digital technology and would have been out in front of it had he and his wife Barbara had not tragically died in a plane crash in August 2002. I remember the first morning at the workshop—we were all serious amateurs but none was an accomplished professional and we were all nervous that our skills might not be worthy in the eyes of someone so outstanding in the field of landscape photography. He quickly put us at ease, however, with an introductory slide show that began with his first image taken during a mountain climb. While the image itself was well composed, it was otherwise unexceptional and that was his point. Comparing that ordinary to shot to examples of his more recent work, he said the difference was gaining an understanding of the qualities of light. One can apply that understanding in any outdoor photographic situation, not just in extreme wilderness locations. Readers unfamiliar with Galen Rowell should get their hands on his book, “Mountain Light: In Search of the Dynamic Landscape.”It’s available at the Mountain Light Gallery in Bishop California. 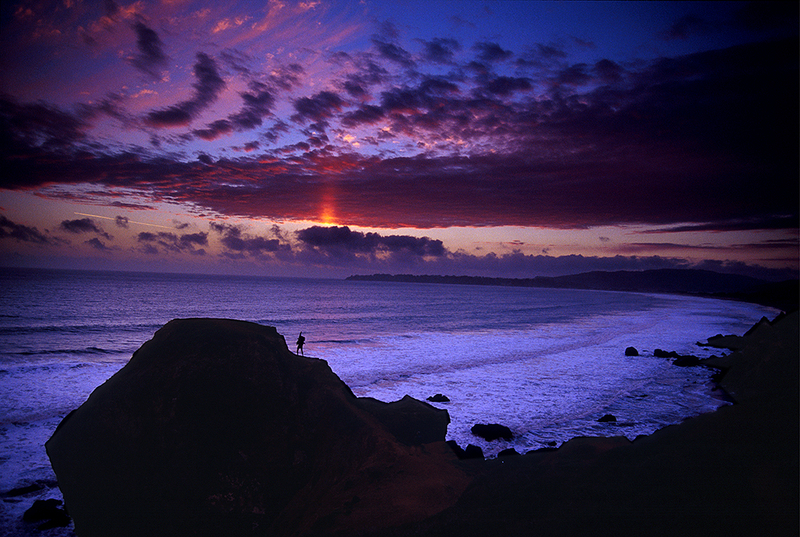 The image of Stinson Beach above was my first successful attempt to capture a twilight image and was taken a few days after the workshop. At the time, I was using a Nikon F-100 SLR and shooting Ektachrome 100VS transparency film. As we learned in class, I used a tripod for sharpness, a graduated neutral density filter to hold back the brighter sky, and took advantage of a hiker’s presence to give a sense of scale. 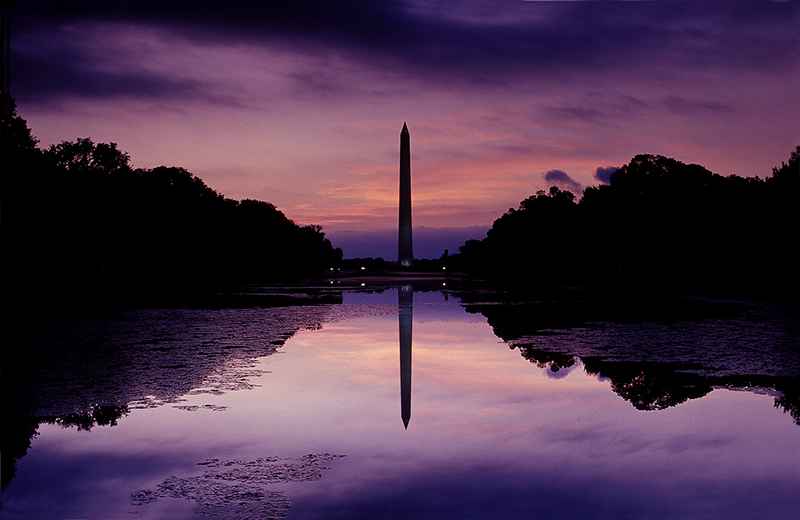 The image above was taken in September 2001, about 6 months after returning home from the Galen Rowell workshop. It’s an example of what can happen if you ignore bad conditions and show up anyway. The sky was completely overcast when I drove into DC but I thought I could at least scout a location for an image of the Lincoln Memorial that I had in mind. But as I walked up to the Reflecting Pool, there was a slight break in the clouds in the east. I quickly abandoned my original plan and set up my tripod and camera just as the magic began to happen. It lasted maybe five minutes. Since that morning, I’ve been to this same spot many times at sunrise but have never seen colors like these again. The primary challenge in shooting during twilight is being in the right place to be because the moment passes quickly. Sometimes it’s luck; sometimes it’s planning. I’ll return to this subject in future posts. Every so often I like to take a quick drive through the city to check on what’s happening with some of my favorite locations. Yesterday I decided it was time for another because spring will soon be upon us. Typically, I am looking for construction projects that may finally be completed, the appearance of new obstacles since my last scouting run, whether a given fountain is running, and what flowers might be in bloom. So what follows is an example of a periodic report that will be of interest primarily to photographers interested in possible photographic opportunities in the coming weeks. Major News: Access to the observation tower will be ended soon, most likely by the end of March in order to make way for the renovation of the building by the Trump Organization. The tower will re-open in 2016. See my blog post with details here. Fountains: It is still too early for most fountains and I didn’t see any that were operating during my circuit. If you have a specific favorite (mine is the Bartholdi Fountain across Independence Avenue from the Botanic Garden), you can send a question using the comment field. National Gallery of Art, East Wing: The exterior work, involving the removal and reinstallation of the marble veneer seems nearly done. The estimated completion date is spring 2014. A single large construction crane remains on the Madison Avenue side and there is a large temporary construction building on the lawn bordering 3rd Street. Smithsonian Arts and Industries Building: The long-term renovation project continues, but the end for the exterior seems to be in sight. The scaffolding has been removed from many parts and the finished exterior looks great. Unfortunately, according to a 13 January article in the Washington Post, the building will not re-open to the public in the foreseeable future due to a lack of funding for the work needed for public access and operation. 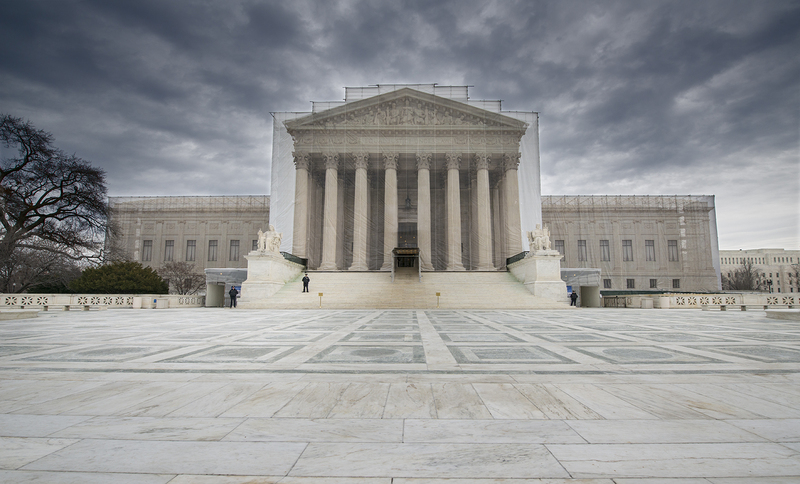 Supreme Court: The repair and renovation of the West Façade was completed last November but the scrim they used during the project was really cool. The scrim was like a big painting of the front to diminish the ugliness of all those scaffolds, a technique commonly used in Europe. But it’s gone now and a quick glance at the front of the Supreme Court yesterday showed no sign of any work being done. So photographers can snap away, but be aware that a tripod cannot be used on the plaza or the steps. I’ve been able to use a tripod on the sidewalk without any problems, however. U.S. Capitol Building: The Dome of the Capitol Building is scheduled to go under scaffolding sometime soon, but as of 21 February, there was no sign of work having begun. So if you have plans for photographing the Capitol as it normally appears, you had better hustle. 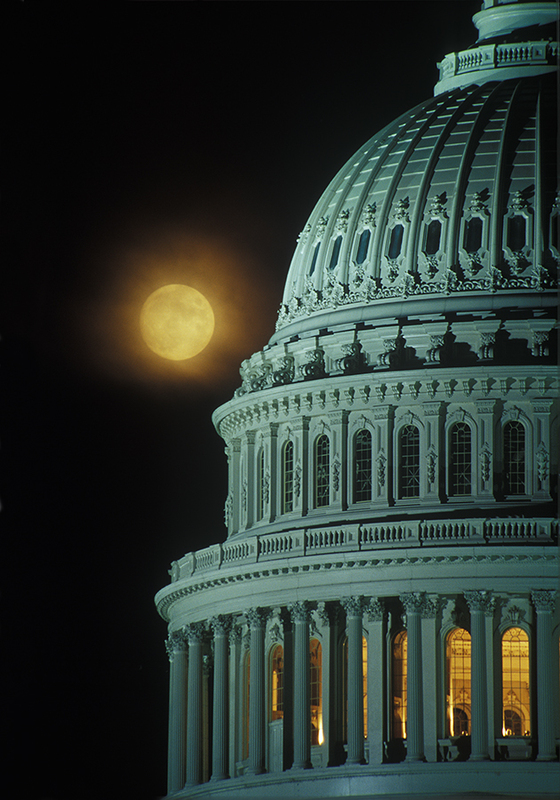 Don’t forget that a tripod permit is required if you want to use one on the Capitol grounds. You can find a copy of their rules and a form here. 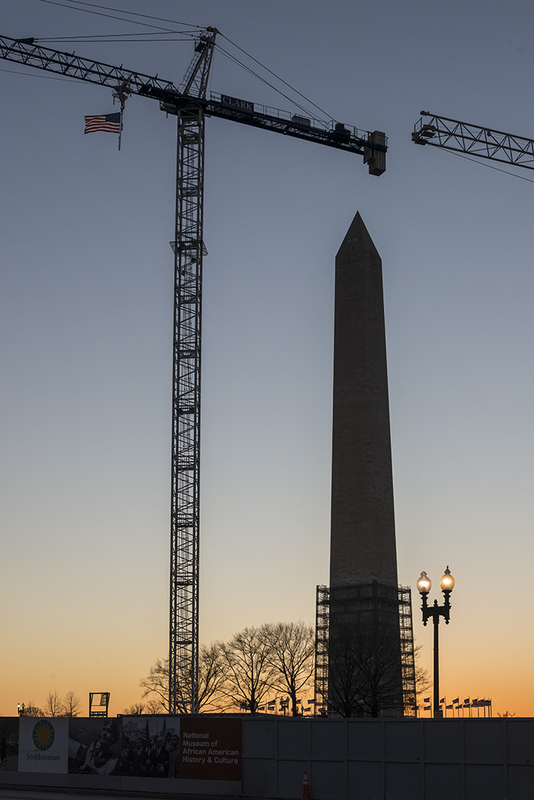 Washington Monument: Although the earthquake repair is finally complete, a portion of the scaffolding is still present. It looks like they have progressed only a little since late December, the last time I photographed it. World War II Memorial: The fountains are not running and the pool is empty. Moreover, the repair project at the west end of the Memorial is still unfinished. A guard told me last year that it had something to do with the recent renovation of the Reflection Pool and we are well past the estimated completion date he gave me. But once the fountains start up again, there will be plenty of shooting opportunities unaffected by the work site. At least once a month, I look back at what I was photographing a year ago, especially when the weather prevents me from going out and doing something useful. Today is such a day. Going back to my images of this week one year ago it turns out that I had been working on twilight shots of the Old Post Office Building which, among other things, has an observation tower that boasts the second highest viewing point in the downtown area. The Washington Monument, of course, is higher. But looking over those images, I was reminded that, even though the 100-year-old building is still standing, it is yet another example of how the Washington architectural scene is constantly changing. Originally Originally constructed in 1898-99, it became a target for demolition almost immediately, but managed to fend off proposal after proposal for “redevelopment.” (An excellent history of the Old Post Office can be found here, WashingtonStreets.com.) The building’s most recent incarnation included the tower, operated by the National Park Service, a commercial pavilion on the ground floor featuring tourist shops and fast-food eateries, and federal offices in the upper floors. But all that is about to change. 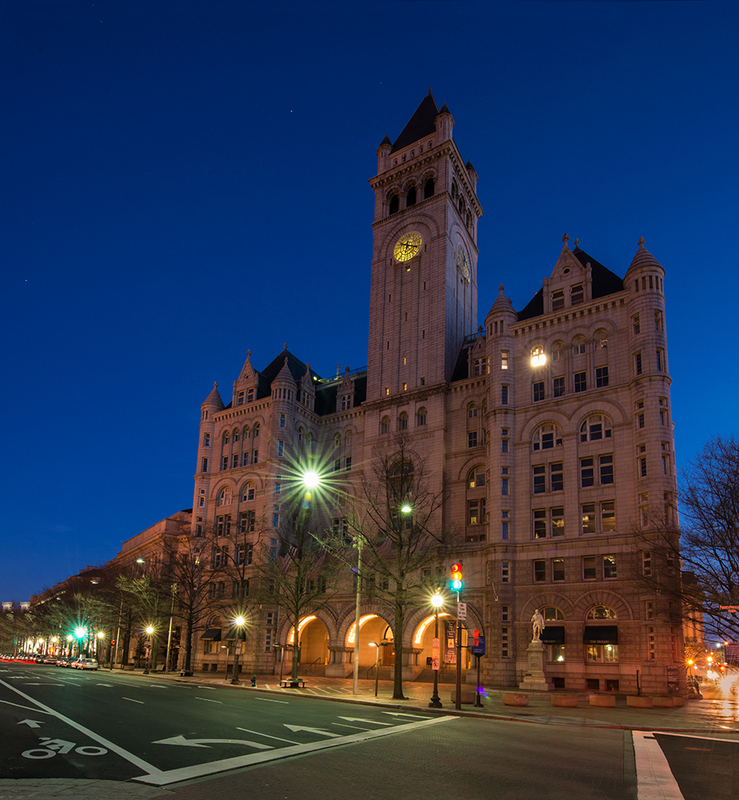 The General Services Administration, which owns the building, has awarded the Trump Organization (Yes, that Trump!) a 60-year lease to renovate the building and operate it as a luxury hotel. The commercial pavilion closed down earlier this month and I’ve been told by a National Park Service representative at the Tower that once construction begins, it will be closed to the public for about two years. So if you want to check out that view from the tower before 2016, you had better get over there before the end of March. The good news is that the exterior of the Old Post Office will remain essentially unchanged and the Tower will re-open to the public once the construction work inside is finished. The photograph here was taken from a location in the middle of Pennsylvania Avenue, using the median strip to avoid the traffic passing in both directions on either side of me. (Technical data: Nikon D800E with 14-24mm f/2.8 lens. The exposure was 15 seconds at f/16, ISO 400, and lens set to 16mm.) The small aperture produces the “star effect” of the street lights. The trick was to choreograph the exposure with the traffic lights so no cars would pass through the scene. It was easier than on a normal evening because that day was a federal holiday and there was no rush hour to speak of. What’s the deal with the banner photo? While I spend time figuring out how to operate in the WordPress environment, I might as well tell you a little bit about the image at the top of this page. I live in Northern Virginia, just upriver from Washington, DC. So the city is where I do most of my photography, usually at this time of day (twilight) and often with a lunar or solar theme. Aside from the fact that this image could squeeze into the aspect ratio dictated by WordPress (1000 X 288), it also evokes my approach to photography. Here is another image taken less than 15 minutes later. Things change quickly at twilight. In upcoming posts, I’ll talk mostly about photography in Washington, suggesting possible locations and the best times to be there. I suspect there also will be occasional stories about the “Tripod Police” as well as the images that got away. Comments and questions are always welcome.